A complete kit consists of a parts kit, power supply and the chassis. You don't need anything else! Our chassis ships from Italy. Due to VAT regulations, you must purchase your chassis directly from our partner Hifi2000. When you click the button below, the parts and power supply will be added to your cart here at The diyAudio Store and you will be taken to view your cart. At the same time, another window will open for you to purchase your chassis from Hifi2000. Stereo chassis or monoblocks. Easy to Build. Everything included. Watt's new in the Amp Camp Amp V1.6? We're excited to announce the latest revision of our most popular and in demand kit of all time, the Amp Camp Amp. V1.6 features new and upgraded connectors and switches, including a Neutrik XLR input so you can build balanced monoblocks with twice the power! Just solder a few more wires to turn it into a single-ended or fully balanced monoblock with twice the power of the standard ACA! What Exactly is an Amp Camp Amp Anyway? The Amp Camp Amp was created by Nelson Pass for a special event called "Amp Camp" in which 20 people built their very first amplifier from start to finish in one afternoon. The event was held outdoors on a lovely sunny day in California and all attendees walked away with a fully functioning amplifier and a smile on their dials. Naturally, other people wanted share that same amazing experience of successfully building their first amplifier so diyAudio has created the three essential ingredients you need for that same journey - the parts, the instructions, and the community. Read more in the Amp Camp Amp article hosted on diyAudio. Once you build the Amp Camp Amp you'll never look at power and distortion figures the same way again. Each channel is just 8 watts, but they're very good watts. In fact Nelson's DIY endeavors are called "First Watt" because in his own words "The first watt is the most important watt". The amp has enough power for medium to high efficiency speakers at normal listening levels. They sound even better bi-amped with an active crossover. It can take days of searching and ordering from multiple suppliers to obtain all these parts. We've done that for you. Everything you need is included, other than basic tools. 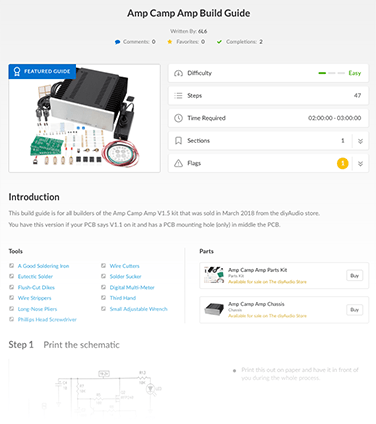 We've put together an all new detailed build guide for the new ACA complete with step by step photos and instructions so you're never lost. Plus, our friends at TekThing recorded a beautiful 30 minute build-video of how to put together the previous version! Even a kid can build it and many have! All you need it one afternoon and you'll have finished and be listening to a beautiful class A stereo amplifier! Nelson's company Pass Labs makes some of the finest (and most expensive) amplifiers in the world. This amplifier has its roots in decades of award winning amplifier design experience. Less is more. Nelson is famous for his "Zen" approach to design and this amp is no exception - it's a minimalist circuit that delivers purity through simplicity. Most amplifier designs switch transistors on and off causing noise. Class A amplifiers are always operating in their sweet spot, which is why people say they sound "silky smooth". You could spend days or weeks trying to find the right parts, then paying over and over for shipping from multiple suppliers. Or you could buy the Amp Camp Amp kit! We've got you covered with easy to follow step-by-step visual Amp Camp Amp Build Guide. There's also an amazing build-video of an earlier ACA version from TekThing showing construction from start to finish! Don't sit on the sidelines - get building today! You'll learn new skills you can apply to other projects, refine your ear and duly feel pride in your accomplishment. If you want to hear the sound of one transistor clapping this is the ticket. Dead silent, pure and luxurious. Reviews speak for themselves: "Insane detail", "deep bass", "crystal highs", "great power", "fluid", "sharp", "smooth", "sweet". The Amp Camp Amp Kit sounds like a much more expensive amplifier, is quick and easy to build, simple to understand, includes all the parts, comes with instructions, and has a wealth of support if you need it. You can't go wrong with this tried and tested project. As you breathe life into these amps, they'll literally breathe it back to you! Be a part of the super friendly Amp Camp Amp maker community on diyAudio and meet other makers that share your obsession with quality sound. We've just launched "diyAudio Guides" (beta), a brand new place to find and share knowledge about audio DIY. The Amp Camp Amp Build Guide is now more accessible than ever. Follow step-by-step on your phone or tablet while you're actually building the amp or printed the guide as a PDF - it's never been easier to complete your Amp Camp Amp in one sitting! If you need more help, there's hundreds of diyAudio members who consider it their mission to help any ACA builder get their first amplifier build completed. No question is a stupid question in the ACA thread, so join in the discussion and meet other first time and veteran builders in the Amp Camp Amp discussion thread. TekThing is an awesome video blog for technology geeks. In this 30 minute video Patrick Norton talks about the history of the Amp Camp Amp, and then builds a channel from start to finish! If you like the video consider subscribing to the TekThing YouTube channel for regular geekery or become a patron and get perks! Please note that in this video Patrick applies the Keratherm incorrectly - you need to peel off the backing before applying it! What's In The Complete Kit? This power supply is Nelson's lab tested recommendation, but to save money you can BYO 19V or 24V 5A laptop style power supply. YMMV! It has a generic 3 prong IEC 60320/C13 power cord inlet suitable for use with a "kettle cord"
We ship it with a Linvox 3271V86 6 foot cord that has a US 3 prong plug. If that plug doesn't work for you, you can use a plug adapter, or "borrow" an IEC cord from your least favorite piece of equipment. All the work done is for you - just screw it together! This project requires some tools. Power (monoblock) 15W into 8 Ohms per channel. See ACA operation modes for details on monoblock operation. More specifications found in the original ACA V1.0 article, and power and distortion graphs are here. See ACA operation modes for more details on monoblock operation. The ACA is a minimalist, low power amp that's easy to build and the perfect choice for your first amp building project. It's the "fixie bike" of Class A amplifiers; no gears, no brakes; zen and the art of amplifier maintenance. It likes efficient speakers that present an easy load to the amplifier. The right pairing will give you great sound full of audiophile buzz-words, and more than adequate volume for everyday listening or to annoy your neighbours (8W with 91db speakers gives 93db at the couch). Double the power per channel with monoblocks. If you have a particular pair of speakers in mind, ask about them in the ACA discussion thread. "Insane amount of detail, deep bass and crystal highs! Tried few old restored amps with 4000M's, ACA's are perfect match so far. So, thanks Mr.Pass for this eye-opening experience..."
"I have it my office and it blows away the Yamaha AV receiver I have been using (until today). I am very surprised by the difference. Definition and sound stage are so much better. This with low end bookshelf speakers...I am hooked!" "The amp sounds great....great power, bass and massive detail...Amazing amp for the build cost. The amp is dead silent between tracks." "I am using 4 x ACA's kits to drive 8 ohm Selenium D405 midrange and BMS 4540 high frequency compression drivers in a Digital XO tri-amp set up... I am impressed with the sound quality - highly detailed, yet smooth and sweet." "Amps go together so easily! Really a great initiation!...absolutely massive, dense, fluid, sharp as a knife sound. Played a few tracks I'm familiar with and the hairs on the back of my head nearly lifted me off the floor!!" "Spent 2 nights assembling the kit and volia now it is singing. Source is a old niam cd2 > BA3 FE > ACA > Markaudio Alpair 6 floorstander. I am amazed by the sound quality. Once again, thank you Papa Pass." A beautiful class A amplifier design from the master of the art with all the parts, instructions and help you need. Easy to build, sounds great! I've more than 30 years experience listening to Hi-End equipment, but I hardly found a solid state amplifier that's cheap enough and sound that good, the greatest part of this amplifier is simple, though the output just 5W (24V power supply, stereo), but it can drive my Totem Rainmaker (4 Ohm) with quality sound, and less than 10 hours after I finished the construction! I'm no good in circuit reading and complex wiring, but I'd manage to make this within one day and the bias adjust is easy! Highly recommend for anyone love quality sound! Good parts selection. Amp worked fine from fist turn on. Thank you for make the kit available. Never having done one of these kits previously I wasn't sure what to expect. The designers of this kit obviously understand that novices may struggle with some parts of the build. The excellent build guide and the high quality of the parts go a long way towards rewarding the builder with a successful outcome. The diyaudio forum thread for this build was invaluable to me. But the best part is how this amp sounds. It far exceeded my expectations. It's really good. * For non-contiguous US states please contact us directly for a quotation.